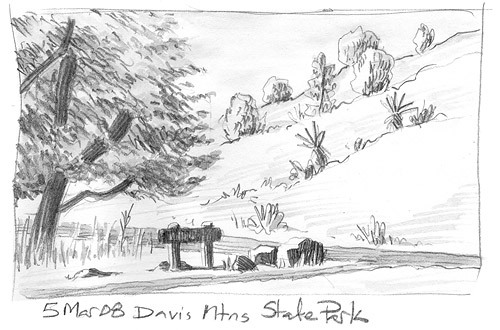 We took a short day trip into the Davis Mountains this week and hiked around the State Park. We always bring our sketchbooks on hiking trips, and almost never actually use them, but this time, for some reason I cannot explain, I sketched. I added a little ink wash after we got home. It's nothing too fancy or anything, but I felt like I had better luck with the tree in the foreground than I usually do with that sort of thing. Masses of foliage are generally really difficult.